ariba: Seamless Connectivity that "Just Works"
ariba provides what services and applications seek: seamless connectivity that "just works". Providing this connectivity introduces increasing challenges, e.g., wireless network access, mobility, heterogeneity, and middle-boxes (e.g., firewalls, or NAT gateways) impede end-to-end communication and, therefore, hinders the development of new services and applications. Each of those challenges has its tailored solution. However, most of the solutions need dedicated support by the infrastructure, require manual configuration and do not adapt to changing network conditions. Furthermore, they often do not run across heterogeneous networks (e.g., pure IPv4, IPv6, or different networks behind NAT-gateways). To ease development of services and applications, and, to deploy them spontaneously, we developed the ariba framework which is part of the spontaneous virtual networks (SpoVNet) project. ariba provides service and application developers, a simple, yet extensive, interface which addresses the challenges described above. To this end, ariba itself uses Peer-to-Peer (P2P) techniques, to be independent of dedicated infrastructure. Therefore, it uses the resources of the end-systems only. ariba deploys an P2P overlay network for each application. Self-organization of this overlay minimizes configuration overhead. Furthermore, the structure of the overlay adapts to changing conditions in the underlying network. Thus, applications do not need dedicated mechanisms to handle communication interruptions, or mobility, for example. To operate upon different networks ariba uses other participants as "relay" to provide connectivity between all end-systems. ariba is developed by the ​Institute of Telematics (research group of Prof. Zitterbart), ​Karlsruhe Institute of Technology (KIT) as part of the ​SpoVNet project. The ​Baden-Württemberg Stiftung kindly funds this project within the Förderprogramm Informationstechnik Baden-Württemberg (BW-FIT) program. ​Omnibus-Filetransfer is a great example for an application build on top of ariba. ariba is under active development and open to contributions. If you have any questions regarding ariba, please send an email to the info[at]ariba-underlay[dot]org or join the ​ariba Google Groups. 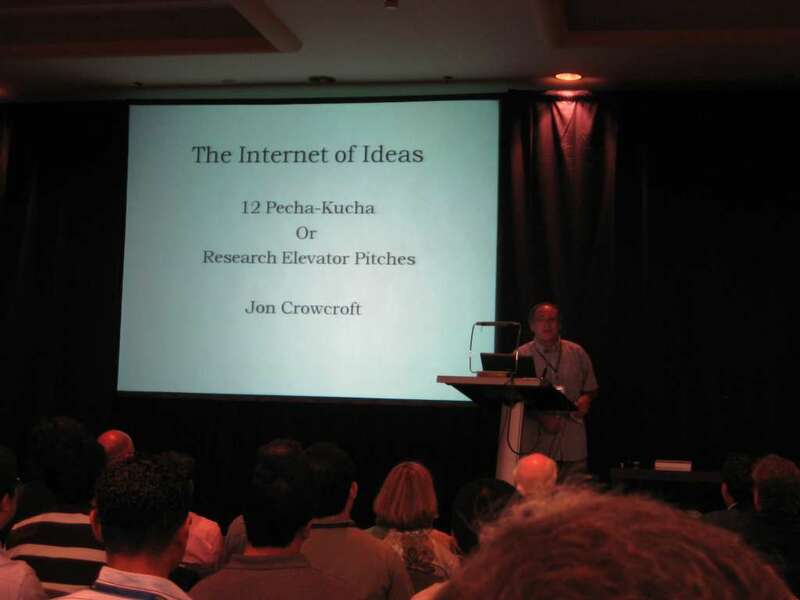 If you publish research results based on ariba, please cite ​this paper. ariba wins KuVS Software Award The ariba Framework developed by the Institute of Telematics was awarded with the KuvS Software Award 2011. 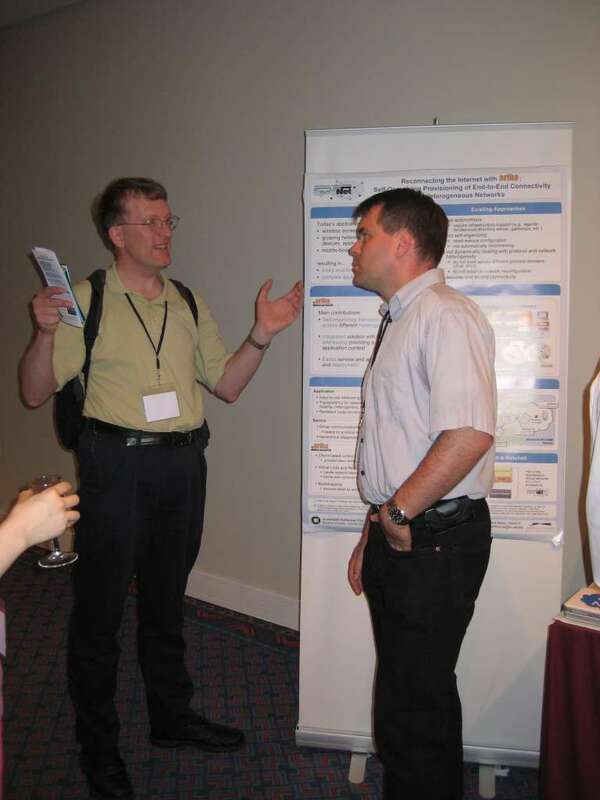 During the Conference on Communication in Distributed Systems (KiVS) 2011 that was held in Kiel the ariba-Framework was awarded as the best communication software. One more time the researchers' effort to leverage their results was recognized by the industry and the scientific community. ariba + MCPO + VLC = overlay based scalable video streaming We have published our ariba/MCPO based VLC streaming plugin. VLC is the well-known multimedia player for video and audio. It comes with a number of streaming modules, but none that supports overlay-based application layer multicast streaming. The ariba/MCPO streaming plugin called aribaMC provides scalable overlay-based application layer multicast streaming with all features that ariba gives you: handling of NAT, mixed IPv4/IPv6 support, Bluetooth support, mobility handling, automatic bootstrapping ... More info here! ariba ported to Android. Currently work with the svn trunk version, see documentation. ariba ​0.7.0 and MCPO ​0.5.1 released. Log4cxx now optional, better support for automatic library downloads, bugfixes. ariba+MCPO overlay based streaming module for VLC released! More info here! ariba 0.5.0 and MCPO 0.4.0 released. 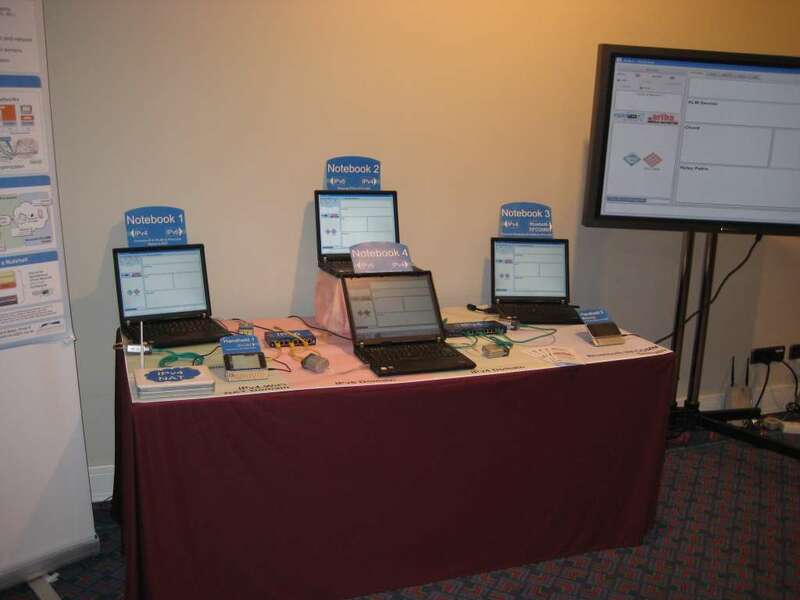 ariba Legacy Demo presented at IEEE INFOCOM 2010. We will release the Legacy support version soon. 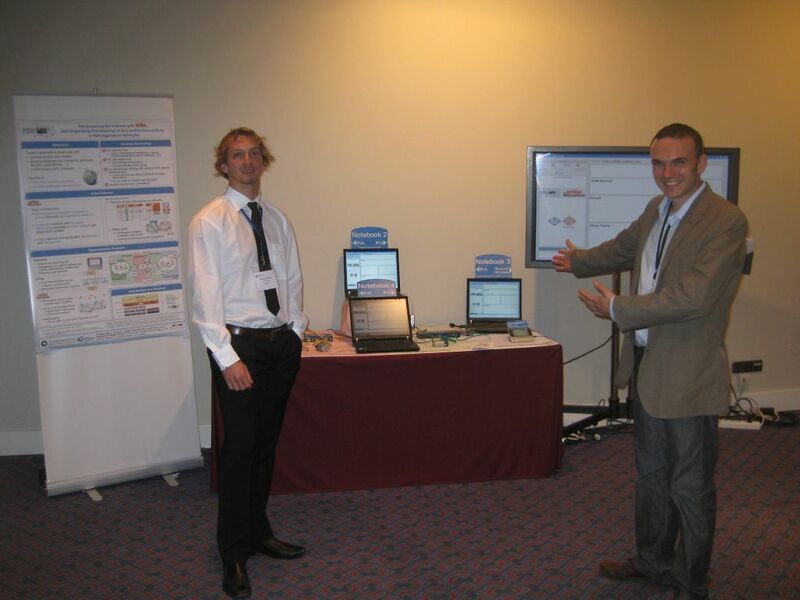 The ariba Group attended this year's ACM SIGCOMM 2009 in Barcelona to present the demo "Reconnecting the Internet with ariba: Self-Organizing Provisioning of End-to-End Connectivity in Heterogeneous Networks". 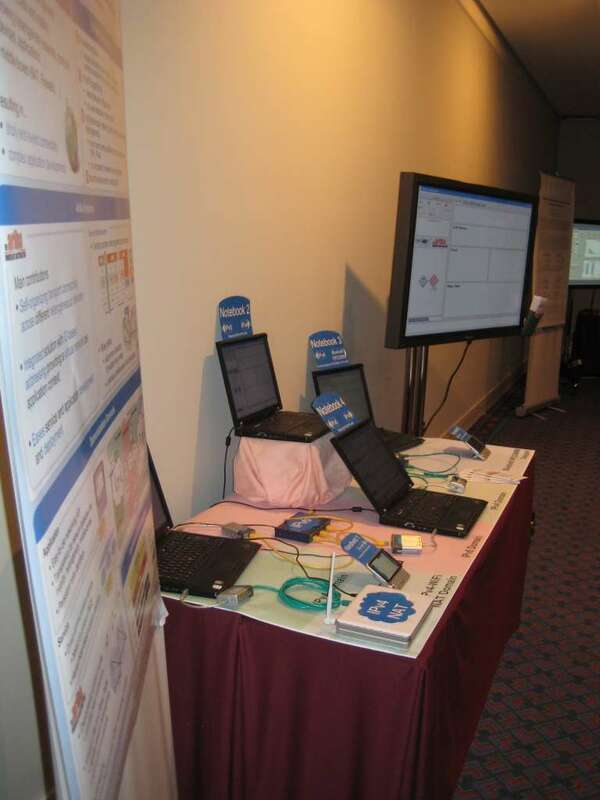 The demonstration covered a scenario in which several heterogeneous protocols and devices were connected in face of network changes and reconfigurations. There was a huge interest in the topic and fruitful discussions. The demo was awarded a Honorable Mention by the committee and therewith made it 2nd best demonstration out of 25. 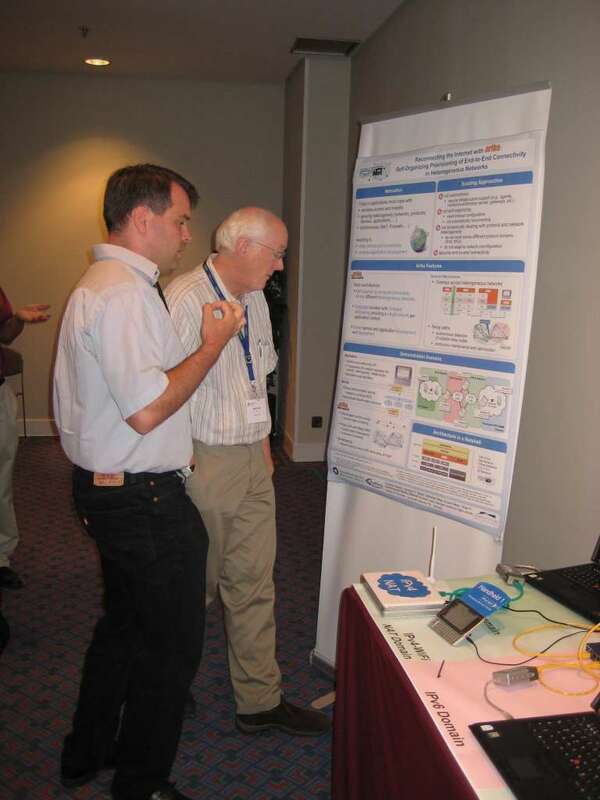 See pictures below and ​SIGCOMM 2009 Demos. 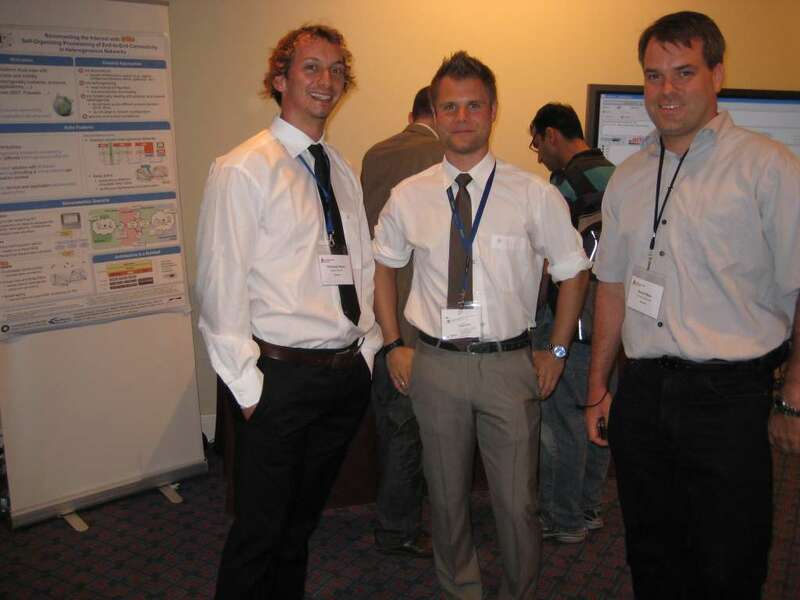 software-ariba.png​ (16.1 KB) - added by Christoph Mayer 8 years ago. 1_big.jpg​ (43.2 KB) - added by Christoph Mayer 8 years ago. 1_vs.jpg​ (11.3 KB) - added by Christoph Mayer 8 years ago. 2_big.jpg​ (62.6 KB) - added by Christoph Mayer 8 years ago. 2_vs.jpg​ (12.2 KB) - added by Christoph Mayer 8 years ago. 3_big.jpg​ (54.6 KB) - added by Christoph Mayer 8 years ago. 3_vs.jpg​ (11.4 KB) - added by Christoph Mayer 8 years ago. 4_big.jpg​ (79.1 KB) - added by Christoph Mayer 8 years ago. 4_vs.jpg​ (14.6 KB) - added by Christoph Mayer 8 years ago. 5_big.jpg​ (60.6 KB) - added by Christoph Mayer 8 years ago. 5_vs.jpg​ (13.0 KB) - added by Christoph Mayer 8 years ago. 6_big.jpg​ (61.9 KB) - added by Christoph Mayer 8 years ago. 6_vs.jpg​ (13.3 KB) - added by Christoph Mayer 8 years ago. 7_big.jpg​ (63.9 KB) - added by Christoph Mayer 8 years ago. 7_vs.jpg​ (12.7 KB) - added by Christoph Mayer 8 years ago. 8_big.jpg​ (67.6 KB) - added by Christoph Mayer 8 years ago. 8_vs.jpg​ (12.2 KB) - added by Christoph Mayer 8 years ago. 9_big.jpg​ (75.3 KB) - added by Christoph Mayer 8 years ago. 9_vs.jpg​ (14.1 KB) - added by Christoph Mayer 8 years ago. 10_big.jpg​ (65.9 KB) - added by Christoph Mayer 8 years ago. 10_vs.jpg​ (13.5 KB) - added by Christoph Mayer 8 years ago. 11_big.jpg​ (58.2 KB) - added by Christoph Mayer 8 years ago. 11_vs.jpg​ (11.5 KB) - added by Christoph Mayer 8 years ago. 12_big.jpg​ (82.8 KB) - added by Christoph Mayer 8 years ago. 12_vs.jpg​ (11.0 KB) - added by Christoph Mayer 8 years ago. ariba-mit-hut_rdax_82x98.png​ (27.4 KB) - added by Christoph Mayer 8 years ago.